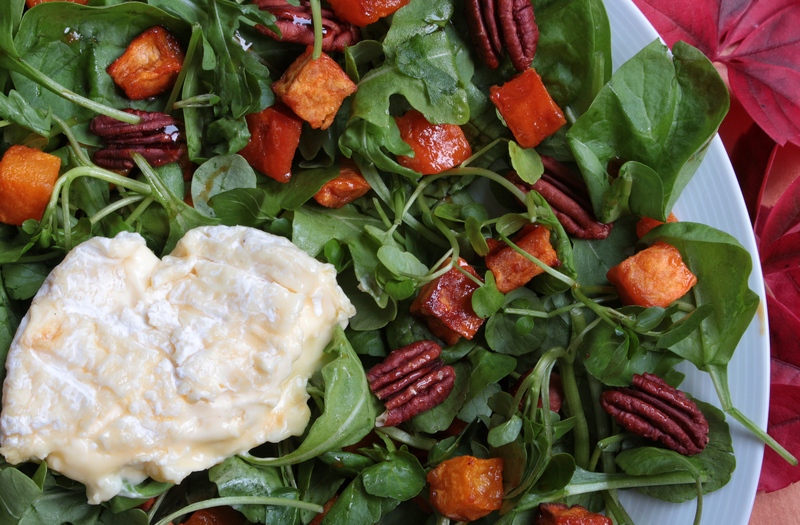 Maple roasted squash and pecan salad, with a soft sticky cheese | dash.drizzle.dollop.devour. It’s suddenly very autumnal out there. The trees are sequentially turning golden and the breeze carries with it the scent of burning leaves, bonfires and chestnuts, hanging in the cold night air. A light mist seems to settle most evenings now, as the sun sets ever earlier, mixing atmospherically with the smokey scent in the air. I’m happily continuing my current obsession with sweet potatoes and squashes. On a crisp Autumn day, sometimes a salad can seem like just the thing for supper, yet once it’s gone dark, all salad thoughts rapidly evaporate in favour of eating something warmer and comforting. This is the salad for such an evening – warm, sweet squash and buttery, rich pecans contrast beautifully with rich, creamy cheese and peppery rocket. The combination of squash and pecans crops up a lot in seasonal American recipes – squash and pecan pies seem intrinsically linked to thanksgiving. Whilst we don’t have thanksgiving in the UK, the flavours still epitomise the Autumn season for me. You want a lovely, sticky soft cheese for this recipe. I bought one from a cheese stall on our local market and can’t remember exactly what it was, maybe a Cardo or a Wigmore, but it was the sort of cheese that oozes satisfyingly from its rind when left at room temperature. A goat cheese could also work well with this. Make sure it’s removed from the fridge at the start of the cooking time to allow it to warm up and bring out the flavour. Preheat your oven to 180C (fan) and chop half of a butternut squash into cubes. Toss in 1 tbsp oil and 2 tbsp maple syrup, sprinkle over a little salt. Roast for 30-40 minutes until lightly browned and softened through. For the last 5 minutes of roasting time, scatter a handful of pecans into the tray to toast in the oven. Once cooked, drizzle over another tablespoon of maple syrup. Prepare a couple of handfuls of salad leaves. I like a nice robust peppery mixture, with some rocket and watercress included. Dress lightly with a little balsamic or other sweet vinegar. Scatter the squash and pecans over the leaves and add some chunks of the cheese. Serves 2, takes around 45mins. mix peppery salad leaves, around 100g. Lovely cheese of your choosing.